Sober Look: What has been supporting gold prices? What has been supporting gold prices? 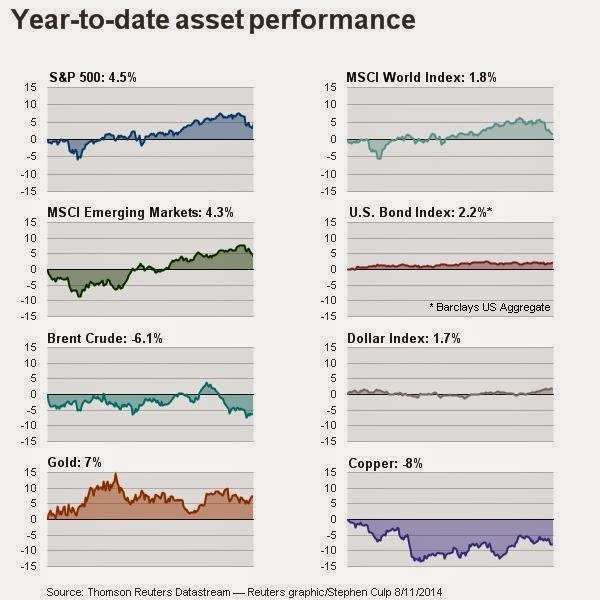 As the chart from Reuters shows, gold has outperformed all the major asset classes this year. 1. As discussed earlier (see post), China's monetary policy continues to be quite supportive for credit expansion. 2. Japan's growth will likely fall short of BOJ's projections (see chart), prompting the central bank to accelerate QE or at least maintain it over a longer period. Credit Suisse: "We see additional BoJ easing coming in November." 3. The Australian unemployment rate has been considerably higher than expected (see chart), suggesting that the risk to the RBA rates is to the downside (or at least low for a longer period of time). 4. Economic reports from the euro area continue to point to a slowdown (chart below), and while the ECB is unlikely to undertake outright QE or other such measures, the expected period of accommodation has clearly been extended. This is particularly true with inflation rates in a number of member states at dangerously low levels (see chart). 5. While the US recovery remains stable and the Fed continues to taper securities purchases, the "effective" monetary policy has become looser that it was a year ago. 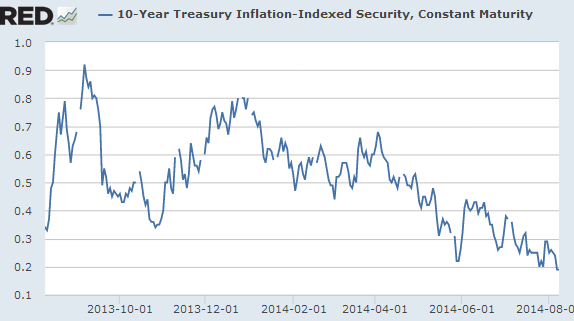 One can gauge this by looking at longer-term real (as opposed to nominal) rates. The 10-year real rates in the US for example have been declining, now below 20bp. That is clearly an accommodative trend. 6. Even in the UK where we had some saber rattling from the BOE about potentially raising short-term rates in 2014, real yields of government bonds remain deep in the negative territory across the curve. The level of monetary accommodation in world's major economies remains quite high, with little indication of near-term withdrawal. That has provided substantial support for gold prices and may continue to do so in the near future.